Crisp Cantaloupe card stock 4-1/4" x 11", scored at 5-1/2"
Whisper White card stock 2-1/4" x 2-1/2"
Accessories: This N That Retro Fresh Washi Tape, Delicate Butterfly punch, Bitty Butterfly punch, Deco Labels Framelits, Glue Dots, Dazzling Diamonds Glimmer Paper, Stampin' Dimensionals, 2-Way Glue Pen. This card is really super duper easy even though it doesn't look like it is. So start off as usual by folding the Crisp Cantaloupe card base on the score line. Now take the piece of Whisper White card stock and apply one of the patterns of Washi Tape at an angle across the card front. Tear off the Washi Tape and wrap it around to the back of the card. If you intentionally put the tape at an angle then you don't have to worry if it is straight or not. Now for the butterfly part. Use the smallest Deco Labels framelit on the piece of Whisper White cardstock. Use the 2nd from smallest Deco Labels framelit on the piece of Pool Party card stock. Glue the two layers together with glue stick. Then punch the butterfly from the center with the Delicate Butterfly punch. Use a Stampin' Sponge to sponge some Pool Party ink around the edge of the label. Then stick this layer onto the card front with Stampin' Dimensionals. Use the Bitty Butterfly punch on a scrap of Dazzling Diamonds Glimmer Paper. Use a Glue Dot to stick the glimmery butterfly inside the punched out butterfly of the label. To dress up the inside of the card stamp the image from Chalk Lines on both sides in Pool Party ink. Then use the Delicate Butterfly punch on a scrap of Pool Party card stock and sponge the edges of the butterfly with Pool Party Ink. 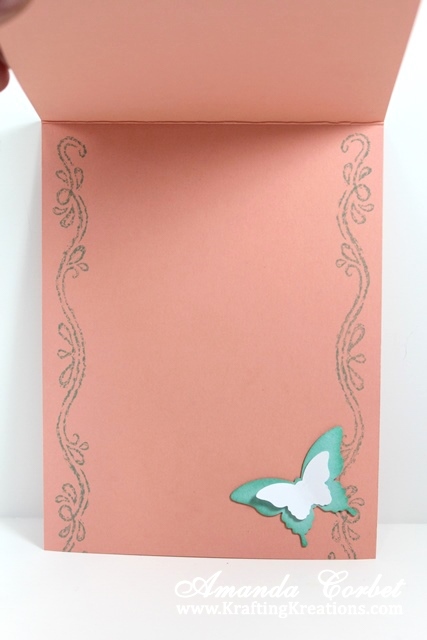 Use the Bitty Butterfly punch on a scrap of Whisper White card stock. Use 2-Way Glue Pen to glue the butterflies together then glue it onto the inside of the card.